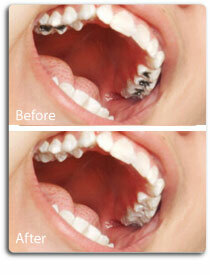 We offer a wide variety of general, cosmetic, and orthodontic dentistry services. Whether you're looking to improve your smile or simply want a regular cleaning, we have the skills to help. Click the links below to read about some of the most common procedures we perform. Whitening is one of the most common cosmetic procedures in dentistry. 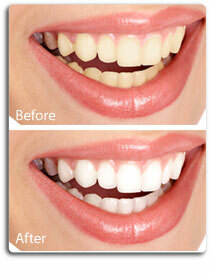 Teeth whitening can create confidence and improve your appearance and smile. Our office uses both customized whitening trays and professional strength white strips. It's safe effective and fast, very fast. Your teeth will be dramatically whiter. The convenience of these in comparison to days of using strips or wearing trays makes it the perfect choice for the busy individual. The tray method involves having impressions taken from which laboratory fabricated custom trays are made. A carbamide peroxide gel is placed in these trays and the trays with gel are worn for about 30 minutes or longer, depending on sensitivity and whitening results. The entire process generally takes 3-4 weeks of daily use to achieve the desired result. Several different strengths of gel may be used, however the higher the strength the greater the likelihood of tooth sensitivity. For maintenance of whitened teeth the trays should be used every several months. The direct technique usually involves placing composite resin on the outside of the tooth. This method is usually referred to as bonding. A dental implant is an option to replace one or more missing teeth. In this procedure, a small titanium 'root' that is surgically implanted into the bone and allowed to integrate. The bone integrates with the titanium 'root', which additionally slows or stops the bone loss that occurs when the root of a natural tooth is missing. Once the implant is firmly set in the mouth, the dentist then works to attach a replacement tooth onto the top of the 'root'. This permanent solution has several advantages over bridges including: implants cannot decay, adjacent teeth are not affected, implant teeth can be flossed normally. 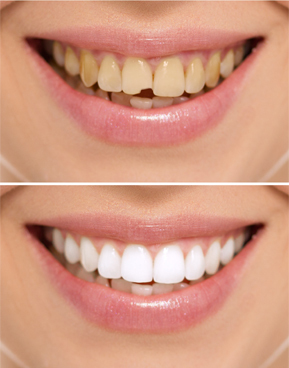 Tooth colored fillings are also known as resin or composite restorations. When using this type of restoration, we first select the right color of bonding material to match your teeth, and then we prepare your teeth as necessary. Next, we apply a conditioning agent to ensure that the resin bonds properly. Then we apply the bonding material and sculpt the resin into the desired shape. Depending on the material, we may harden it with a special, high-intensity light. Lastly, we smooth and polish the new restoration. Once in place, bonded restorations are very strong. Bonding can give you beautiful, natural-looking teeth that will improve your smile. Perhaps you played a little too hard, or maybe you fell or had some other accident. The result is a chipped tooth. Or perhaps your teeth have darkened or become discolored. Whatever the cause, your smile has changed, and you’d like to have your old smile back again. Broken or discolored teeth are unsightly and may have a negative impact on your self-esteem. However, the problems don’t end there: a broken tooth may be more susceptible to fractures and decay. We can treat the teeth with crowns and veneers, but bonding may be a better answer because it conserves a maximum amount of tooth structure and protects teeth from additional wear and damage while still providing great results. 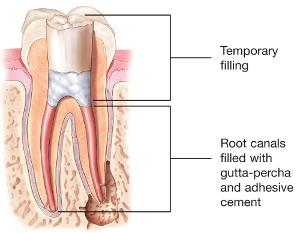 Root canal treatment (also referred to as endodontic therapy) is made necessary when the nerve of the tooth becomes infected or damaged. Many times teeth that are infected suffer from severe decay caused by years of neglect. Other times, deep restorations or trauma to a tooth may cause the nerve to be damaged to the point it needs root canal therapy. By the time the pulp is infected it must be treated and cannot heal on its own. Symptoms that the pulp has become infected may include sensitivity to hot/cold or sweets, pain, swelling, pain to biting or pressure, and a bad taste in the mouth. Sometimes, however, no symptoms are apparent and the person is unaware of any problem until a checkup. Generally, regular cleanings and checkups can help to prevent and detect problems early. Crowns are full coverage restorations that are used to cover or "cap" a tooth that is damaged. They are commonly recommended to prevent a weak tooth from fracturing and to replace a tooth with a large filling and minimal remaining tooth structure. The larger the hole made by a cavity that has to be treated, the more likely a crown will be needed. Many teeth with root canal therapy need a full coverage crown. They can also be used to improve appearance and esthetics. Crowns can be completed in one or two visits depending on the type of crown needed. Talk to Dr. Campbell or Dr. Hickey to see which option is right for you. Bridges are commonly used to replace one or more missing teeth. Bridges are cemented similarly to that of crowns and help to maintain the position of your teeth and prevent rotating or shifting of the dentition into the empty space. Talk to your dentist about all options for replacing missing teeth.